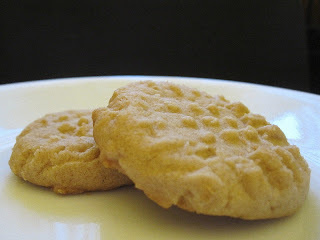 I'm going to get it out of the way early: These are simply the best peanut butter cookies I have ever had. In my life. Period. Stamped it. No erasies. Trust me when I say that I do not make this claim lightly. Most know that I am very picky about anything "peanut butter” and am usually, if not always, disappointed with the flavour. No matter how good the recipe or product I end up thinking "it's good, but could use more peanut butter." Not these cookies. They're near perfect. Don't get me wrong, I enjoy all things peanut butter but they never meet my expectations, especially cookies. I find that peanut butter cookies in general have too much sugar. To me the sweetness of the cookie always infringes on the flavour of the peanut butter. No sir, I don't like it. I want the peanut butter to be the star; sweetness should be the undertone. This may lead to a cookie that's a little saltier than normal, but this is what I want. Maybe it's not for you, and if it isn't, then peanut butter is not your mistress (which is a good thing, I'm tired of sharing :)). The peanut butter flavour of these cookies is awesome, there's just so much of it. And in an attempt to slightly enhance the PB flavour I swapped the brown sugar from dark to light so that the molasses wouldn't run any interference. This also helps to slightly reduce the overall sweetness since I was going to use Regular Kraft Peanut Butter, which has added sugar, instead of natural. This recipe is very specific about a few things, one of them being to allow the batter to refrigerate for 2 to 12 hours before baking. I have made these cookies twice, once with a 2 hour chill and once with a 12 hour chill, I didn't notice a significant difference in flavour (if any). So fret not, just stick with two hours, you're not going to want to wait anyways. Oh and beware this cookie dough. I gave it a little taste before baking and was very close to negating the oven all together. If I hadn't been making some for my Aunt, it could have become a very shame filled afternoon. One amazing thing I discovered about these cookies is that they are also extremely good when they are slightly under baked. You see, the batter was cold coming out of the fridge and I didn't let it come to temperature before putting the first batch in the oven. Even an extended bake time could not completely bake a few of my first cookies. As I took a bite I found that it was crispy just until the centre where I was suddenly treated to a creamy texture and a rich peanut butter flavour (my eyes are welling up just thinking about it). It was pretty awesome. An accident? Yes, but so was penicillin. The completely baked cookies are more than something special. They have a very shortbread-esque texture to them, no doubt due to the high ratio of Peanut butter in addition to the butter. They simply crumble and melt in your mouth all with a peanut butter overload. Bliss. Let me reiterate: these cookies are by far the best peanut butter cookies I have ever had. If you at all like peanut butter and peanut butter cookies you need to make these. I'm not really sure you can pack anymore peanut butter flavour into a cookie. I suppose you could always slather peanut butter directly on top of one peanut butter cookie, and then top it off with another peanut butter cookie. Kind of like a peanut butter peanut butter whoopie pie (or the Oreo from heaven). But that seems kind of like cheating. Not that it's a bad idea, quite frankly I think it's a wonderful idea. In fact, I might go do that right now. Yields approx 4 1/2 dozen 2 inch cookies (I used this cookie scoop). In a medium bowl add flour and baking soda and whisk to combine. In the medium bowl of a mixer add butter, sugar, brown sugar, and salt and beat on medium until smooth but not fluffy (approx 1 minute). Add peanut butter, egg and vanilla, and beat until smooth (approx 30 seconds). Remove from mixer and, by hand, fold in dry ingredients until just combined. Preheat oven to 350F and have large cookie sheets ready (depending on your cookie sheet you may want to lay parchment paper down, I did not). Remove dough from fridge and allow to sit for 30 minutes to come to temperature (or spoon dough onto cookie sheets and let it come to temperature). Drop by rounded teaspoons onto cookie sheets approximately 2 inches apart. Using a fork (or offset spatula) press down on dough ball to create criss-cross pattern flattening to 1/4 inch thick. Bake for 10-12 minutes or until cookies are golden at the edges (10 minutes for quite light, maybe even a bit under baked depending on the temperature of the dough; 12 minutes for quite dark. I found 11 minutes to be the best time) . Allow cookies to cool on cookie sheet for 1 to 2 minutes before moving to rack to cool completely -- These cookies are ridiculously good warm, so try not to eat too many before they’ve cooled. 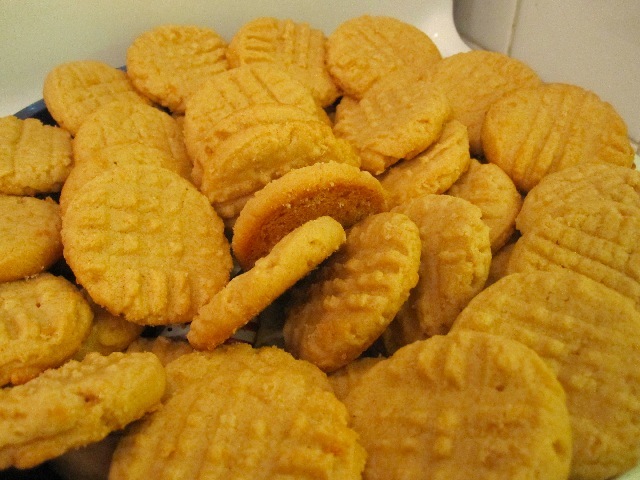 We must have the same taste in peanut butter cookies because I thought these were the best ever as well. If you ever have some chipotle powder around, try adding a little chipotle powder to some of the dough. You can add it to just a portion for testing, of course. It sounds weird, but chipotle goes really well with peanut butter cookies. well that! just sounded fantastical! I've had 'hot' pb cookies b4, but just with cayenne, which was deee-licious!..I'm giving this a shot! merci! Hi Paul. It's awesome to find another person who wants their peanut butter cookie to taste like peanut butter first and everything else second. And I'm so happy you liked the recipe. Using a natural peanut butter would make the cookie a tad less sweet and salty, but other than that, they would not be much different in flavour. Do you have to put them in the fridge for 2 hours and then make them come back to room temp. ? @Jessica -- No, just warm enough that you can easily manage the dough. The only thing the temperature of the dough is really going to affect is your baking time. As the dough warms up on your counter you will need to adjust your baking time as the warmer dough will obviously take a little less time to bake. You don't have to worry about how much the cookies will spread when the dough warms up, because these cookies don't spread much, which is why you have to press them down a bit before baking. Thanks Zofia! :). I'm really happy you enjoyed them as much as I did. It's always nice to meet people who love PB as much as I do. And great tip about the freezer :). Thanks again! :). Ha ha....I am so excited! These are by far par none to any other cookie. I found this recipe while madly surfing for the perfect PB cookie. So delicious. I am on batch 3 already. I added reeses PB chips and roasted peanuts. Marvelous. Thank you for sharing this gem.